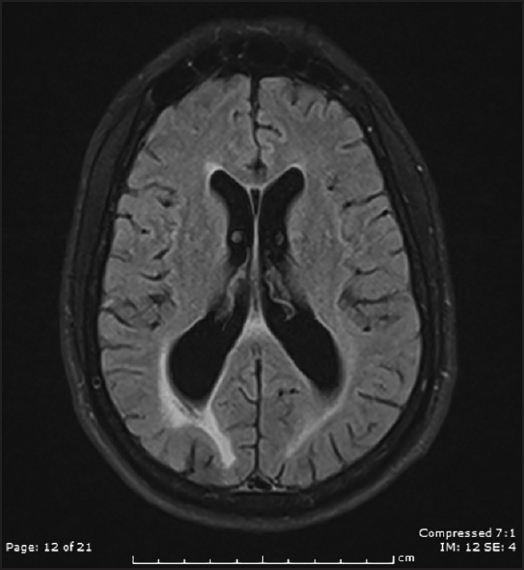 A 49-year-old previously healthy male presented with a 2-year history of gradually progressive speech abnormalities, unstable mood, gait imbalance, vision changes, and overall cognitive decline. On examination, he was alert and oriented but very anxious. Cranial nerve examination revealed visual acuity of 20/200 in both eyes and mild dysarthria. He had difficulty in identifying objects and was unable to repeat certain phrases. He was hyperreflexic throughout with bilateral upgoing toes and had positive cortical release signs such as glabellar reflex, palmomental reflex, and jaw jerk. His cerebellar function was slow but intact. Additionally, he had a wide-based gait. Initial laboratory findings were unremarkable but magnetic resonance imaging (MRI) of the brain revealed hyperintensity on T2 and fluid-attenuated inversion recovery (FLAIR) images within the periventricular white matter and significant involvement of the subcortical white matter in the occipital lobes. Additionally, there was diffuse atrophy with asymmetric right white matter volume loss greater than left white matter volume loss, particularly within the occipital lobes and hyperintensity in the splenium of the corpus callosum. There was no significant signal change in the anterior temporal lobes. A wide array of tests was performed including adrenoleukodystrophy but neurogenetic testing finally revealed a heterozygous c.3691C > T variant in the NOTCH3 gene, confirming the diagnosis of cerebral autosomal-dominant arteriopathy with subcortical infarcts and leukoencephalopathy (CADASIL). CADASIL is an autosomal dominant hereditary arteriopathy caused by a mutation in the NOTCH3 gene on chromosome 19p13. The gene encodes a receptor for vascular smooth muscle cells and the mutation leads to loss of vascular smooth muscle cells, which leads to fibrosis of the small penetrating vessels leading to chronic white matter ischemia. The clinical symptoms usually start in the fourth decade and the mean age of presentation is 47 years (±10 years). The first clinical manifestation in CADASIL is often associated with attacks of migraine with aura. This is seen in 20-30% of the patients and presents between the age of 20 years and 40 years. The most frequent clinical manifestation of CADASIL is ischemic manifestation, which is seen in 60-80% of the patients in their fourth and fifth decades. Cognitive deficits are reported in most individuals after the age of 50 years and dementia is usually seen after the age of 60 years. Psychiatric symptoms that are mainly due to episodes of mood disturbances are seen in 10-20% of the patients during the course of the disease. Seizures have also been reported. White matter hyperintensities on T2-weighted images and FLAIR sequences, which are symmetric, bilateral, and usually seen in the periventricular region and deep white matter. This is predominant in the frontal, parietal, and anterior temporal lobes followed by the external capsule. The occipital lobe is less severely affected. Lacunar infarcts present as low signals on T1-weighted images and are often seen in the semiovale, thalamus, basal ganglia, and pons. The lacunar infarcts tend to occur later in life. 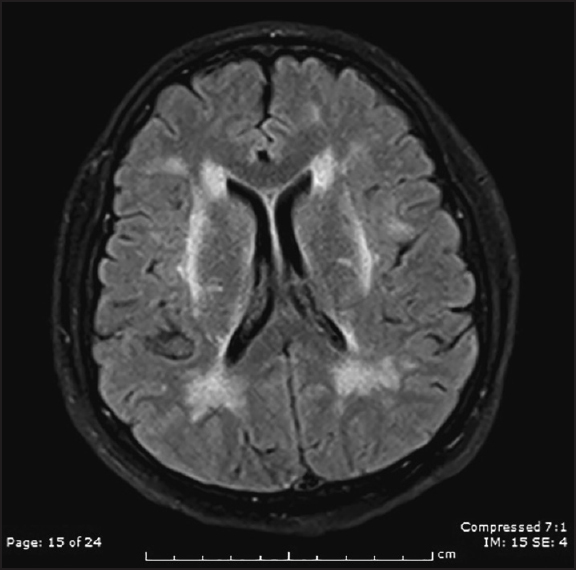 Our case exemplifies the atypical imaging features in CADASIL. It is a rare case of occipital lobe predominant CADASIL lacking the typical anterior temporal lobe involvement. The absence of temporal involvement in patients with CADASIL has been reported in the Asian population but our patient was not Asian. Our case had predominant involvement of the occipital lobe [Figure 1] and [Figure 2], which is not as frequently involved in CADASIL. Our case also lacked involvement of the external capsule and the characteristic lacunar infarcts and cerebral microbleeds that is often seen in patients with CADASIL [Figure 3] and [Figure 4]. Our patient did have an involvement of the corpus callosum, which can occasionally be seen with CADASIL. Previously, involvement of the corpus callosum was often confused with multiple sclerosis. MRI in general is helpful in the diagnosis of CADASIL and for follow-up of disease progression. However, in our case, the MRI findings were not characteristic of CADASIL. 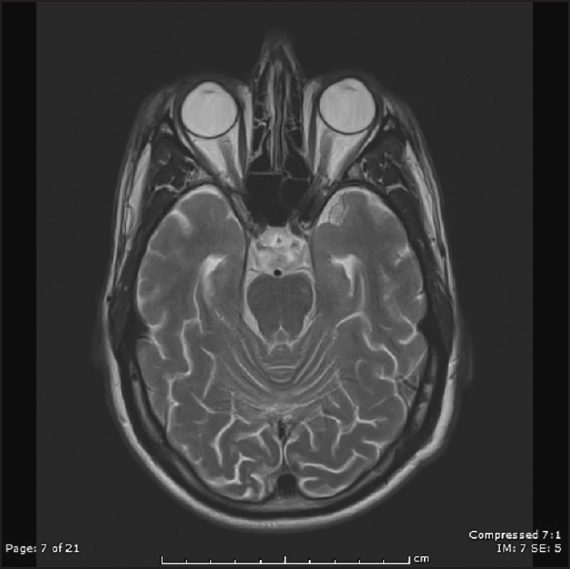 Although MRI is an invaluable tool for the diagnosis of CADASIL, it is important to identify that occasionally atypical findings on MRI may be seen and not all patients will have the characteristic anterior temporal lobe or external capsule involvement. Auer DP, Pütz B, Gössl C, Elbel G, Gasser T, Dichgans M. Differential lesion patterns in CADASIL and sporadic subcortical arteriosclerotic encephalopathy: MR imaging study with statistical parametric group comparison. Radiology 2001;218:443-51. Moreton FC, Razvi SS, Davidson R, Muir KW. Changing clinical patterns and increasing prevalence in CADASIL. Acta Neurol Scand 2014;130:197-203. Yousry TA, Seelos K, Mayer M, Brüning R, Uttner I, Dichgans M, et al. Characteristic MR lesion pattern and correlation of T1 and T2 lesion volume with neurologic and neuropsychological findings in cerebral autosomal dominant arteriopathy with subcortical infarcts and leukoencephalopathy (CADASIL). AJNR Am J Neuroradiol 1999;20:91-100. Chabriat H, Bousser MG. Neuropsychiatric manifestations in CADASIL. Dialogues Clin Neurosci 2007;9:199-208. Stojanov D, Vojinovic S, Aracki-Trenkic A, Tasic A, Benedeto-Stojanov D, Ljubisavljevic S, et al. Imaging characteristics of cerebral autosomal dominant arteriopathy with subcortical infarcts and leucoencephalopathy (CADASIL). Bosn J Basic Med Sci 2015;15:1-8. Chabriat H, Joutel A, Dichgans M, Tournier-Lasserve E, Bousser MG. Cadasil. Lancet Neurol 2009;8:643-53. Yamamoto Y, Ihara M, Tham C, Low RW, Slade JY, Moss T, et al. Neuropathological correlates of temporal pole white matter hyperintensities in CADASIL. Stroke 2009;40:2004-11.